You are looking at a jetton issued under the provisional government on July-November 1917. It is possible that certain of these jettons are in actuality medals presented by the Provisional Government. However, this information could not be corroborated. 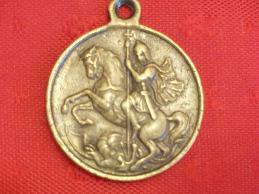 The obverse of this jetton shows St. George on a horse slaying the dragon. 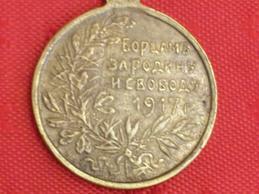 On the reverse, it reads in russian "Patriots were fighting for the freedom, 1917". Underneath, in very small lettering, it reads "Made by Private Factory. D. Kuchkin. Moscow".